Photo by Sharon It is 10:30 in the morning and 49 degrees outside, but inside Baskin Robbins, Chuck Osborne is putting ice cream in the glass fronted coolers for the afternoon rush. Since 1998, Chuck has continued the traditions begun in 1952 when Ken Napolitano first opened the Midtown store and carried on next in 1967 by Wilson Nichols (who owned the video store next door until his recent passing) then Chuck. 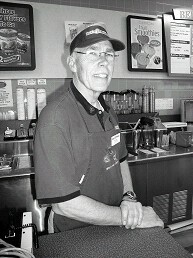 Now, after more than a decade of scooping, Chuck is retiring at the end of January to travel and practice his avocation, the triathlon, as well as spend more time at his local YMCA in San Carlos/Belmont. He will have more time for his three times a week EACH of swimming, bicycling and running. Past President of the Mt. View Rotary, he will continue his decades long service with the club as its secretary.